Can anyone take a look at my site and tell me what you think? (comments/ suggestions/ improvements/ comments about the content). in the comment box on the 'healthy recipes & food' page. If anyone has a health site we can link to eachothers site if you like it and we can link to each others site and vice versa. Thanks to anyone who does this! Hi, Michelle, i think your on to a good idea with this site, its got a lot of potential. I love the look and feel of the site - like i said before it needs filling out with content. You can add a favorite icon from the content side bar (just under where you added your window titles and keywords) -- these could do with filling out a bit as well - i use around 10 keywords per page and about 150 characters in my window titles - (no one knows the exact perfect amount) but yours are short for sure. Apart from that, images would be great on the home page - a picture says a thousand words :) - people need an insentive to move on through the pages. if you want to use this just right click it and save image as. I forgot to mention that I added it as a favicon and then put it on my site..but it didn't work somehow? A very nice beginning indeed... It seems you are well on your way to becoming quite a great website builder. One thing I did take note of is that your images on your Healthy Recipe and Food page are quite large in size. They range from 2.7 MB (2700 kilobytes) to nearly 3.7 MB (3700 kilobytes). Optimally they should be no larger than 100 kilobytes in size. You can reduce the size of your images by clicking on the 'Edit With Picnik' link at the top left of your image on the page. This will open up the Picnik editing dialog. Once the dialog has loaded, under the 'Edit' tab is a resize option. You can use this to resize your image until it's a bit smaller. For the size of your images to be uniform in width (at least) you should in the first size box place 250 and then click once in the second box to allow it to auto adjust the second dimension by itself. Select OK and then 'Save To YOLA'. The image will now be the new size. Scroll down to the heading 'Pixel Pushers' for those Picnik instructions. Thanks for the feedback Duke (or do I say THE duke?). That was very helpful! What is a favicon? is it possible on my home page to link to certain blog POSTS? on the 'rollover' bit that link to my blog posts? If you look at the published page of your blog, the URL in the address bar is the only information you need to get when making links, the rest is simple with Yola. It's always great to see people's site especially when they have a passion for the topic they write about. I would agree that having images that captures your purpose of your site would be a nice touch to have on your homepage. It helps to bring in that visual dimension to your readers. I noticed on your "healthy recipes & food" category, the pictures take a long time to load up. I would suggest editing your photos in Picnik and resizing them. Hopefully this will help to make your page load up faster. It creates a box with all these tag words. If this is something you're interested in, let me know and I can try to find you a code for something like that. You have done a good job in creating your site. I wish you luck with this venture. clouds are ideal when there are lots of classes and tags. Some intersting variations too. See Roy TANCKS WP Cloud tag. That's very clever. A code like that would be really great thanks! where would I add it? I'm not sure why there is an underline on the tags though. of one of each recipe and then the rollover image that says the name of the image- do you know how I could do that? I'll try the picnik thing now and see how I go! I would be glad to help you out. But, I just have to run out right now. Then I'll get back to you. In the meantime, you could try using http://www.htmlbasix.com/mouseoverima... to create your rollover image links. I'll be back to help you out with any problems and to find that tag cloud for you. Thanks littleus! I've started to add some rollover links if you would like to have a look! I feel quite proud now! looks much better already - you know the coffe image in your blog? its a really big file - its 2,304px × 3,072px (scaled to 325px × 433px) you should edit in in Picnik and make it the size its scalerd to now - you will notice it load much quicker. really you could do the same with most of the images in your blogs. MIchelle - i see your mouse over is not working properly. 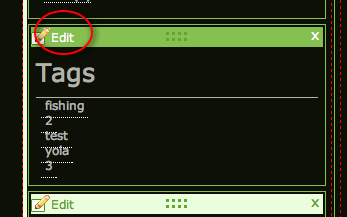 And then add this section where you want it displayed on the page. sorry i just noticed - you will need to change the names of the images if you want to use more than 1 on a page. Would you like some help with your blog? happy to do that if you like. Not sure if you're up and about at 3 am or so but leave a message here and we'll be happy to be here for you. Thanks Duke... do you mean the bit loadImage1 = new Image(); ...or the url under that line? cause the image still doesn't work,..so i'm not sure what I did wrong. Peter- that would be great! Yeah I went tto bed at about 12- so I was asleep then! Lee (The Duke) posted another thread about the problem you were having with your Tags. I did a test and it appears that it is a bug which will need to be logged and fixed. 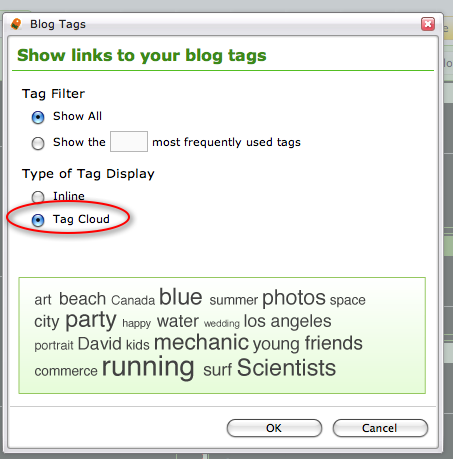 For the time being if you would like you can choose to have your tags in a Tab Cloud instead of Inline. There is a Tag Cloud built into the site builder blog feature. Cool, glad you like it! Thanks for your help on this thread! Thanks Emmy! I like when things are so easy like that! health info) and a copyright thing? if so what should I write? Hi monica...ive started my Disclaimer and this is what i have so far...http://michellesfoodblog.synthasite.c... what do you think? Your disclaimer is fine Mishmo. You mentioned your copyright notice. What would you like to protect? Your web design, your menu or anything else. Would you want people to be able to copy your menus. Do you want people to simply hand thses things out. Do you care if people sell your menus etc. They're considerations if it's important to you. Let me know and I'll help you with it. How's the tag cloud coming along? Happy with it? There is a tag cloud function in your blog. If you look above at Emmy's response, she gives detailed instructions on how to obtain one through your blog.